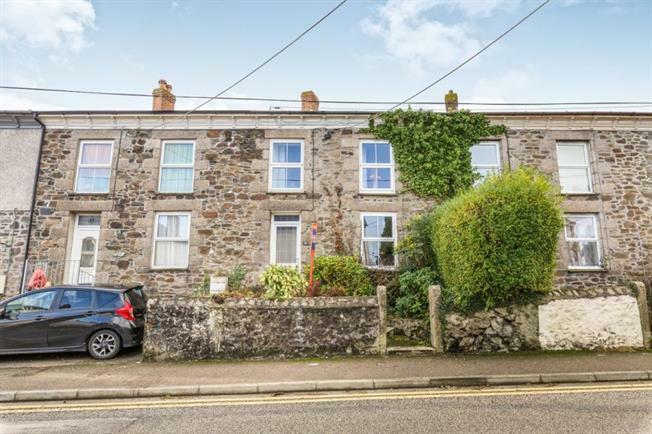 3 Bedroom Terraced House For Sale in Redruth for Offers in excess of £150,000. This deceptively spacious three bedroom property is very well presented with many character features and has a good size enclosed garden to the rear. The property comprises; two reception rooms, fitted kitchen, bathroom and three bedrooms. The property is located in a convenient location with access to local amenities and schools. Upvc double glazed door. High level fuse box. Internal stained glass door. Radiator. Door to lounge and opening to dining area. Stairs to first floor. Upvc double glazed window to front. Fireplace housing gas fire with shelved recess to either side. Beamed ceiling. Cornish range (curently not working) with two shelved recesses to either side with cupboards. Radiator. Doors understairs area and bathroom. Opening to kitchen. Double glazed door and window to the rear. Wall and base units with work surfaces incorporating a stainless steel sink unit and drainer. Breakfast bar. Cupboard housing the worcester boiler. Space for washing machine and fridge/freezer. White suite comprising a panelled bath with shower above. Close coupled W.C. and pedestal wash hand basin. Radiator and extractor fan. Upvd double glazed window to the rear. Loft access. Upvc double glazed window to the front. Radiator. Ornate fireplace with wood surround. Upvc double glazed window to the front. Radiator. Wood flooring. To the front of the property there are steps leading to the front door with a raised area. The rear garden is enclosed by fencing and laid to lawn. There is a small paved patio area with a gate giving access across the neighbouring property.